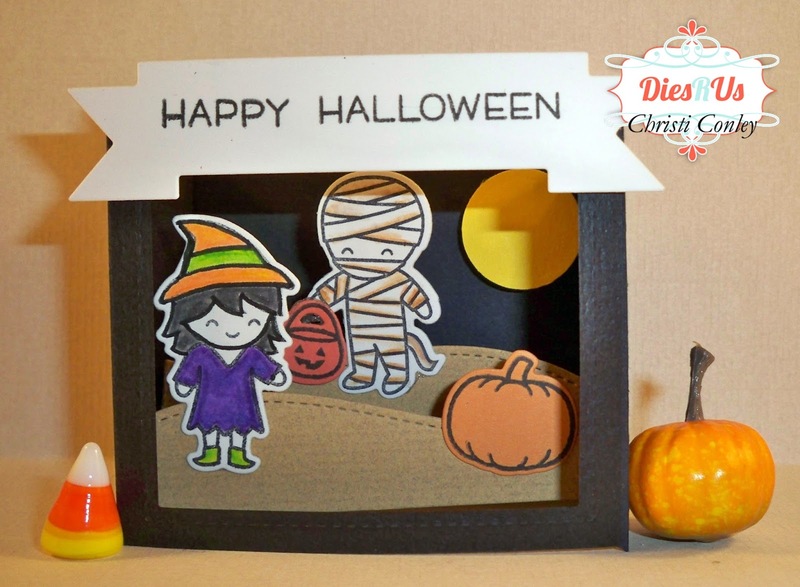 Dies R Us: It's getting close to Halloween! Hello All! Christi with you today and it's close enough for me to begin decorating and creating! I got these really cool "salad grabbers" at the Dollar Tree - they are made from a skeleton arm and hand, and you get 2 of them! I just HAD to grab them and I have been painting them with glow in the dark paint; my goal is to stick them on the lawn so they appear to be coming up from the dirt, BWAHAHHAHHH!! where I color & color & cut and then, days, sometimes months later, I use the items I colored. Well, I did the same with all the cute costumed folks in the Costume Party set. I colored and cut like a madwoman. I even have candy corn, chocolate bars and adorable individually wrapped candies ready to use. I picked out a witch and a mummy to you in this card. 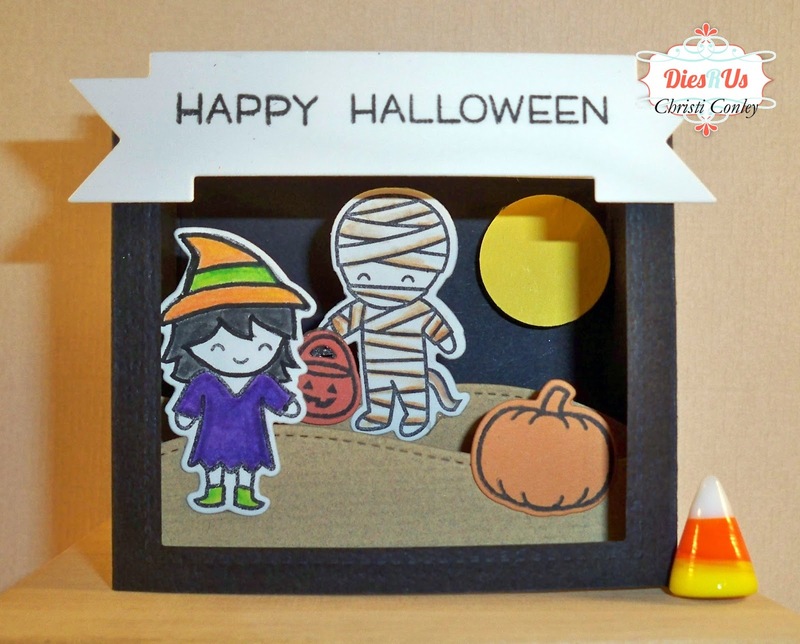 I gave the mummy a cute little pumpkin candy catcher and set a plain pumpkin near my witch. Once I was happy with the placement, I stuck all the elements down. I also used a nice bright yellow card, punched a moon out and pop dotted that to the upper right corner. 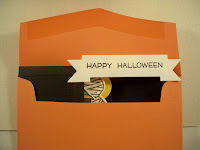 For the grand finale, I made a Happy Halloween banner as a sentiment. 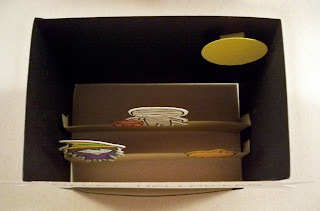 This scrumptious little shadow box will close to fit into a standard A2 envelope so it requires NO EXTRA POSTAGE! That is a huge selling point to me! As you can see from my pictures below, mine did not fit in an A2 envie, due to the placement of the banner. However, it fit like a charm in an A7 envelope, and assuming you haven't stuffed the envelope full of rocks, it should also be able to go out to the USA with one "forever" stamp. Very cute Halloween project Christi! Thanks for all the tips & tricks! Christi, this a perfect and fun Halloween scene on this shadow box card! I wish I had the desire to color like you! too cute! I love it as 3-D, so much more interesting!